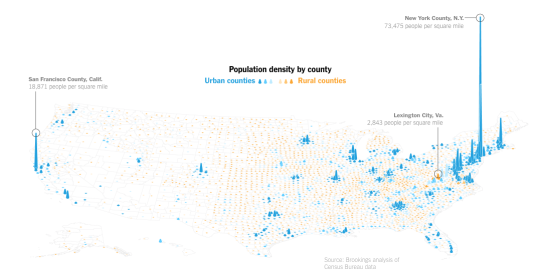 Eduardo Porter recently published this piece in the New York Times on the “relentless economic decline” of small-town rural America. We often talk about rising income inequality, but the greater concern is the alarming rate of joblessness in many of these communities. Earning less than others is not as bad as earning nothing. But, of course, we don’t really have a solution to this problem. Some are suggesting employment subsidies, such as the earned-income tax credit. While others are suggesting that we need to make it easier to build in the large blue spikes shown above. That way we’ll be able to more affordably accommodate the people who will ultimately need to move from rural to urban. While this latter suggestion may seem grim for small-town America, it is perhaps a reminder of what cities really are at their core: Cities are labor markets. They are the places where people come to get a job and make money.